Are you looking to spruce up your yard? Want to plant a tree that will flourish in the Oregon Coast climate? There are plenty of native Oregon trees to choose from, but which are best for residential applications? Vernon Imel Tree Service has the answer for you. We have been serving the Northwest Coast for more than two decades and we’ve seen which trees work best when it comes to brightening up your landscaping. Here are our top picks for native Oregon trees to plant in your front yard. While native trees are most well suited to the Oregon climate, each tree is unique. Some prefer shade, while others do well in full sun. Take a look around your yard and see which tree would work best with your landscaping. If your yard gets a lot of sunlight, the red alder tree is an excellent choice to plant. This tree is low-maintenance and attracts several birds, including the pine siskin and common redpoll, which eat the seeds of the red alder tree. The red alder grows in cool, moist climates and can grow up to 50 feet. Another low-maintenance tree we like is the Willamette Valley ponderosa pine. Unlike the red alder, which is a deciduous tree, the Willamette Valley ponderosa pine is an evergreen tree with green needles and large brown cones. The Willamette Valley ponderosa pine is highly drought-resistant and does best in well-drained soil. One of the tree’s unique features is that its pine cones smell of vanilla. This tree makes an attractive addition to your landscaping, but has the added benefit of filling your yard with its sweet aroma. If you decide to plant the Willamette Valley ponderosa pine, keep in mind that it will need plenty of room to grow. This tree can reach heights of more than 150 feet! The bigleaf maple is a favorite of ours not simply because it’s easy to grow, but because it’s also versatile. The bigleaf maple makes a great shade tree, but also makes a wonderful ornamental tree because of its changing leaves and yellow flowers. 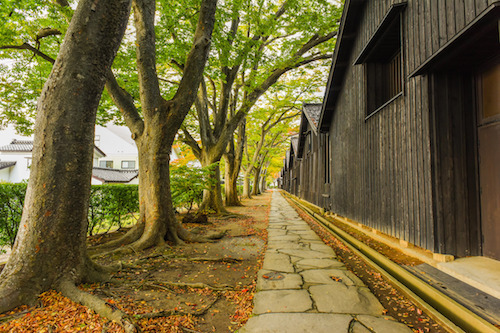 Bigleaf maples typically grow between 40-80 feet in height and feature a wide canopy. They do well in moist areas and can be planted in either full sun or part shade. Like the Willamette Valley ponderosa pine, these trees need plenty of room to grow and should only be planted in very large yards. Another versatile tree is the Pacific dogwood. This flowering tree blooms as early as April and as late as September and produces small, greenish flowers that are surrounded by white bracts. The bracts resemble petals, creating the illusion of large, creamy white flowers. The Pacific dogwood is beautiful in the summer months and equally eye-catching in the fall. During the autumn season, the flowers transform into bright red fruit clusters. The tree also attracts many types of birds, including woodpeckers, sapsuckers, and white-crowned sparrows, just to name a few. The Pacific dogwood does best when grown in partly shaded areas and well-drained acidic soils. Another great native Oregon tree to plant is the Pacific madrone. The Pacific madrone features an attractive orange-red bark and cream flowers that bloom from mid to late spring. The Pacific madrone will make a wonderful addition to any yard, but there are a few things to keep in mind. The Pacific madrone tree should be planted in partial shade to full sun and in well-drained soil. You’ll also want to plant the Pacific madrone in the same direction it had in the nursery since it is susceptible to transplant shock. Also, since the Pacific madrone sheds quite a bit, you’ll want to plant it away from decks or any other area you want to keep clear of debris. For those with smaller yards, the Cascara is an excellent option. Keep in mind that this small, deciduous tree can still reach heights of 30 feet. Be sure to give it ample room to grow. The Cascara will brighten any yard. It has green-white flowers that bloom in May and later transform into berries that attract a wide array of birds. You can expect Cedar Waxwings, for instance, to drop in for a visit. The Cascara does best when planted in moist, well-drained areas and prefers shade or morning sun. If you’re looking to plant a flowering fruit tree, look no further than the Oregon crabapple. 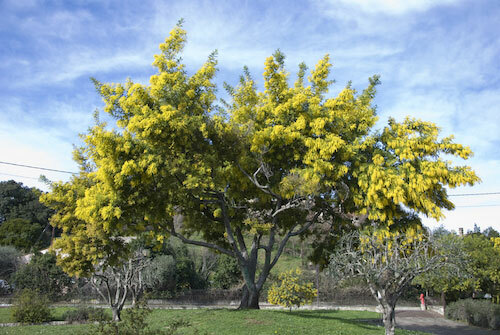 This tree works well in medium-sized yards and should be planted in wet areas. The Oregon crabapple has white to pink blossoms that are quite fragrant and will fill your yard with their aroma. 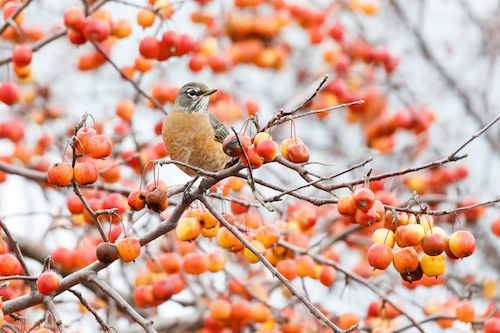 The fruit of the crabapple tree also attracts birds, including finches and cedar waxwings. And by fall, the crabapple’s leaves are bursting with brilliant color. Native Oregon trees are excellent choices to plant because they are already well adapted to the area climate. But they’ll still need an adequate amount of TLC, including frequent watering and pruning, particularly in their first few years. Once your tree begins to mature, you’ll want to prune ornamental trees every year and evergreen trees once every three to five years. You’ll also want to add soil nutrients to your tree every one to three years. It’s also important to have your tree regularly inspected by a certified arborist to make sure it is growing healthy and strong. Oregon is home to 30 species of conifers and 37 species of hardwoods, so there are many native Oregon trees to choose from. If you need more help deciding which tree would work best in your front yard, don’t hesitate to give us a call. We’d be happy to use our expertise to help you spruce up your yard.